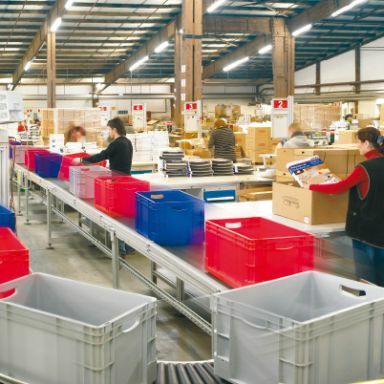 Inno­va­ti­ve Pro­duct con­cepts: Pos­si­b­ly uni­que­ly in Ger­ma­ny, the SILAG group of com­pa­nies offers com­ple­te and intel­li­gent in‐house goods‐flow manage­ment. The logistics cent­re in Lan­gen­feld hand­les pro­ces­sing in bund­les. Here, effi­ci­ent value crea­ti­on based on inno­va­ti­ve con­cepts and goods cir­cu­la­ti­on aimed at pro­mo­ti­on of eco­lo­gi­cal, eco­no­mic and soci­al sustai­na­bi­li­ty is important in the inter­play bet­ween tra­de and indus­try. At six inde­pen­dent operations/production sites in Lan­gen­feld, Solin­gen and Mül­heim an der Ruhr, SILAG Han­del AG employs a total of 500 workers in intel­li­gent, sys­te­ma­tic rege­ne­ra­ti­on of dor­mant capi­tal in the form of tra­de sur­plu­ses. This might be, for examp­le, put­ting inserts from cof­fee roas­ters or flat‐screen TVs from retailers back into mar­ket­a­ble con­di­ti­on for our custo­mers, from new packa­ging for sin­gle pro­duc­ts, some­ti­mes by neu­tra­li­sing the ori­gi­nal trade­marks and ori­gin, to bund­ling of various articles/groups of goods in mar­ket­a­ble and high­ly attrac­tive price‐range dis­play ver­si­ons.